We’re pleased to offer Jewish holiday downloads for BlackBerry devices through a two step process that sends Hebcal data first to Google Calendar, and then to your BlackBerry. Note that Hebcal is not an app for BlackBerry (in the BlackBerry App World sense of apps that you install). Rather, Hebcal is a website that allows you to download/export calendar data to the calendar application that comes natively with your device. Google Apps for Work users use Google Sync for BlackBerry, which uses ActiveSync to sync with Google Apps. See Set Up Google Sync for BlackBerry 10 for more details. Non-enterprise Google users with BlackBerry 5, 6, or 7 can use BlackBerry® Internet Service (BIS), which is part of the standard BlackBerry service plan to sync Gmail, Google Calendar, and Contacts with their BlackBerry. BIS is provided by RIM and mobile carriers. 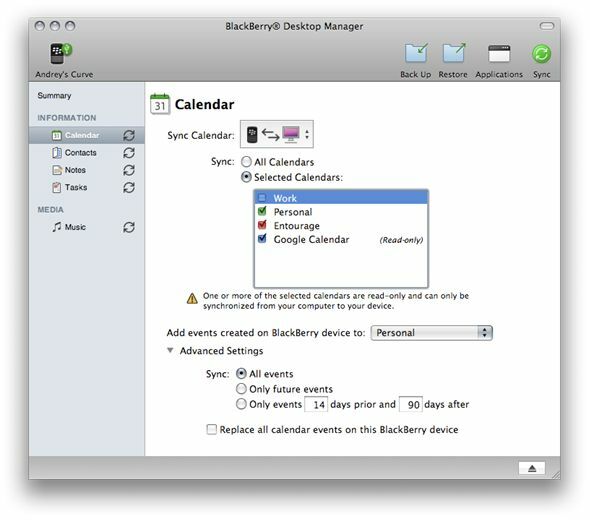 BlackBerry offers this guidance on syncing Calendar. Please contact RIM or your carrier for more information and support. First, subscribe to a Hebcal Jewish Holidays file in Apple iCal. Connect your BlackBerry device to your computer. On your computer, in the Applications folder, click the BlackBerry Desktop Manager icon. In the Information section in the left pane, click Calendar. In the Sync Calendar field, click Two Way. To synchronize all your calendars, click All Calendars. To synchronize specific calendars, click Selected Calendars. Select the check box beside one or more calendars. In the Add events created on BlackBerry device to list, click the calendar on your computer that you want to synchronize the calendar entries from your device to.